More spaces at the Band Club in December! 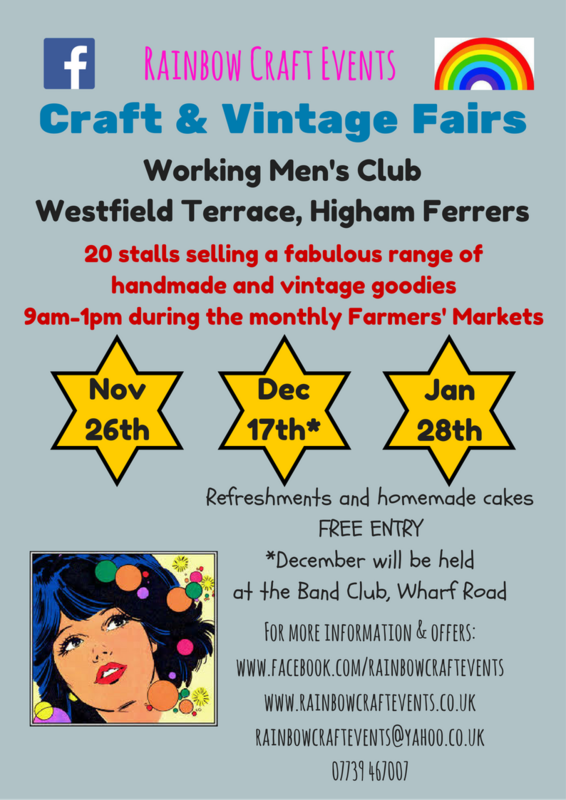 Today was the first time we held a Craft & Vintage Fair at the Band Club on Wharf Road in Higham Ferrers. We usually use the Working Men’s Club but if they’re booked we can use this venue instead. All went well today apart from the expected teething problems with a new venue! I will be making lots more signs to point people in the right direction next time! We had a great footfall and it was fantastic to have a couple of customers come back to see me in the Market where I was handing out flyers and say how impressed they were with the quality if stalls. So lovely to hear positive feedback! We had a great selection of stalls including wood turning, Christmas bauble pictures, fabric gifts, canvas bags, framed pictures plus lots more! Have a look at the photos to get an idea of what was on offer. Two events in November – the Christmas Handmade, Vintage and Gift Shopping Event at Saxon Hall, Raunds on Sat 19th November 10am-2pm and the Craft & Vintage Fair at the WMC, Higham Ferrers on Sat 26th November 9am-1pm. Hope to see you there! As with all the events I organise I work really hard to advertise as much as I can to get as many people through the door as possible. I hand out 1000s of flyers every month during events, at the Farmers’ Market in Higham Ferrers, to schools, nurseries, shops, cafes, hairdressers etc. I advertise in the Raunds Roundup which is distributed to many houses in and around Raunds. I submit articles to the Nene Valley News every fortnight and they’re usually published along with ads for upcoming events. I put posters up in shops etc in Higham Ferrers, Raunds and other areas such as Wellingborough, Rushden and Irthlingborough. I advertise wherever I can online such as stallfinder, stall and craft collective, wherecanwego and radio stations such as Heart and Connect FM. I also regularly share events and posters on all the local Facebook pages and groups. Banners go outside each venue and signs are placed around the local areas before each event. However, I am still looking for more ways! I’m particularly keen to get more people to subscribe to events on Facebook and click ‘going’ or ‘interested’ on each event page. To a certain extent, I’m sure this will all continue to grow with time – Rainbow Craft Events has been running for less than a year so I feel proud of what has been achieved so far and feel confident that as events become more established interest and footfall will steadily rise. This year has been a massive learning curve for me, from trying out different venues and learning from mistakes along the way. Stallholders and customers are always so positive which is so kind and any constructive feedback is genuinely very useful. Thank you! Here are the new flyers ready to distribute! Remember the next event is the Craft & Vintage Fair on Saturday 29th October 9am-1pm. This month we are at the BAND CLUB on WHARF ROAD. Please be aware that the hall we will be using is accessed by a flight of stairs. See you there! 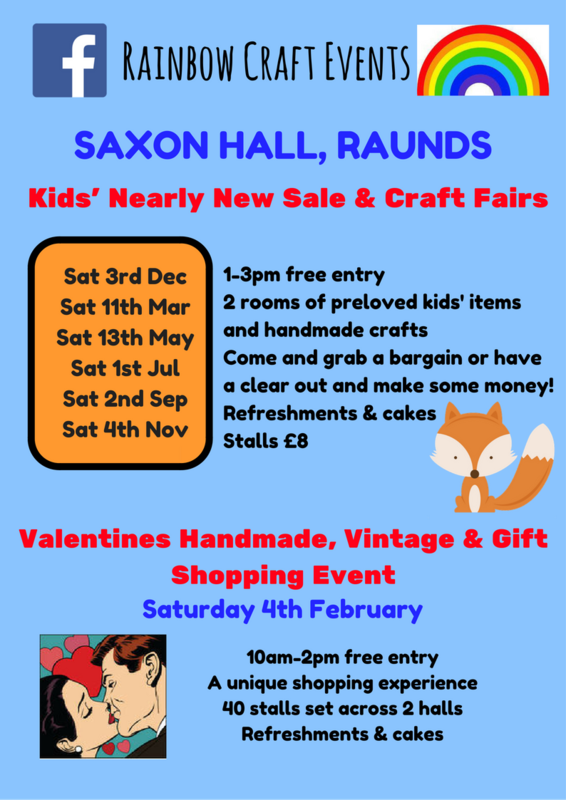 Yesterday was the first Nearly New Sale & Craft Fair at Saxon Hall in Raunds and I’m really pleased with how it all went! It’s always a gamble when you try something new but thankfully yesterday was a successful event! In the larger hall there were 25 craft tables selling all handmade items and as usual, there were plenty of compliments on the high quality of items ranging from chocolate novelties, hand sewn items, wood turning, book folding, preserves, greeting cards and gift boxes, crochet and plenty more. In the second hall was a Nearly New Sale for people selling baby and children’s clothes, toys, books, equipment etc. There were also refreshments and books and colouring for the little ones. This room proved especially popular and lots of customers left with bags full of bargains! The first hour was incredibly busy yesterday which was great and the second hour, as you might expect was a bit quieter. 3-4pm proved rather too quiet though so future NNS/Craft Fairs will now be held 1-3pm instead and all tables will be priced at £8. As with everything, you learn with experience so thank you for any feedback which was given yesterday. I do read it all and any constructive advice is always taken into consideration. Thankfully, the vast majority of feedback was positive with people commenting on the friendly atmosphere, good organisation and amount they had sold. I’m looking forward to the next one now! !